Looking for a moisturizer that's not only skin-friendly but environmentally-friendly too? 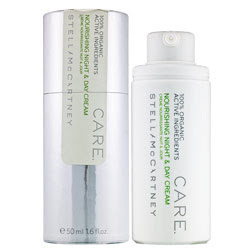 Then look no further than Care by Stella McCartney Nourishing Night & Day Cream. I've been using this for the last two weeks -- which, given my complete and total obsession with Estee Lauder Re-Nutriv Ultimate Youth Creme, is a feat in itself -- and all I can say is WOW. Not only has my skin never felt more hydrated, my complexion has never been more even or had less blemishes. This rich, beautifully scented cream (it gives off a scent of aromatherapy-like goodness that makes me feel like I'm at a fancy day spa) is positively loaded with ingredients that are both good for you and good for the environment. Vegetable extracts repair damaged skin and provide a natural protective layer from the environment, cupuacu butter and blackcurrant buds nourish and soothe, and Brazil nut oil offers anti-aging properties. It sinks into the skin and even has a slight cooling effect, so it just feels so luxe and lush. My one complaint is that it does leave skin feeling greasy for a bit, so don't touch your face too much directly after applying or you'll get a bit of sheen on your hands! Best of all, this lotion is 100 percent organic and officially Ecocert-certified as organic and ecological. The packaging is simplistic yet luxurious -- the white bottle rests within a silver cardboard tube that feels a bit like it came out of the space age. Now, this cream doesn't come cheap -- it's $80 on Sephora's website. But trust this beauty chick when she tells you it's SO WORTH IT. A moisturizer that not only makes you look fabulous but makes the earth more fabulous, too? That's what saving the environment is all about.